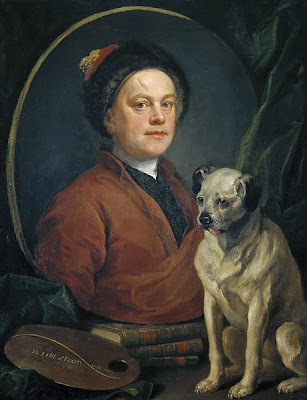 Today marks the birthday of the great William Hogarth, the legendary English painter, satirist and printmaker. He has long been a favourite in this salon and I first encountered his work as a lass when my own mother decorated a wall of our home with his magnificent Marriage A-la-Mode series. We young Gilflurts made up our own stories to accompany the pictures but none of them were half as shocking as the real narrative; still, it certainly set our creative juices flowing! To mark Hogarth's birthday I have decided to feature one of my favourite paintings, The Shrimp Girl. Undated, it is believed that the unfinished oil on canvas dates from the 1740s, and was started as an experiment in working with different styles. By this point in Hogarth's career he was an established, hugely successful figure with nothing left to prove. His sitters paid vast sums to commission paintings and his works were instantly recognisable, influential and lauded by the most illustrious names in the country as well as the public who enthusiastically brought prints of his work and saw them displayed as they went about their lives. 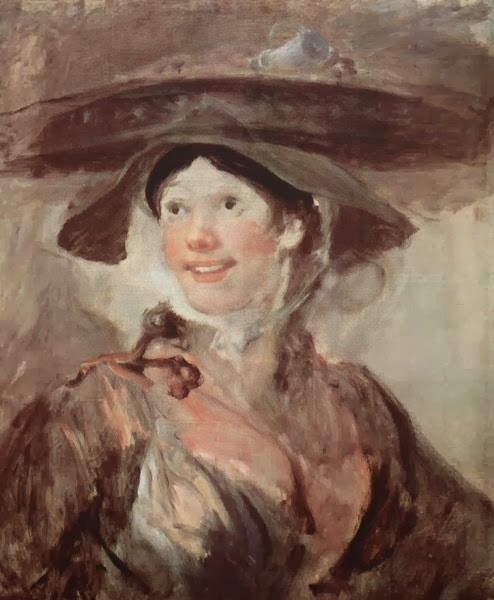 Despite all of this, Hogarth wasn't content to rest on these successes and when he painted The Shrimp Girl he was looking to develop a less formal style, experimenting with elements of impressionism and a light, frivolous touch. The identity of the woman in the painting is lost to time yet she would have been a familiar sight around the fish markets of the capital. From the basket that sits neatly atop her head the smiling girl sells shellfish, the pewter tankard used as a half-pint measure. Hogarth kept the painting at home until his death, never quite finishing the work, and when his widow, Jane Thornhill, showed it to people after his death, she told them, "They say he could not paint flesh. There is flesh and blood for you". In The Shrimp Girl in it we see a natural, joyous face at odds with the sometimes idealised look of the formal Georgian portraits that I so adore. This painting illustrates a long-lost moment of London street life, one of thousands of such moments that occurred every day and Hogarth has captured it, immortalising the unknown, cheerful young woman forever. The Shrimp Girl is not Hogarth's most dramatic work, nor his most magnificent; it tells no satirical tale, not does it present us with an illustrious figure of national importance but it does show us the everyday face of Hogarth's London and that is why, for me, it is his one of his greatest works. If you want to see more works by Hogarth, visit me on Pinterest! I posted an article recently on my blog about The Rookery of St Giles and used William Hogarth's contemporary etching of Beer Street and Gin Lane as one of the illustrations. Ooh, do you have a link? Much obliged, I am off for a read! For the period it is unusual to show a person smiling with their teeth displayed. At the Dulwich Gallery there is a wonderful head and shoulders of a boy painted by Gainsborough which was said to have been done in 45 minutes. Again it shows the artists skill and handling of paint. Oh, I didn't know of that one! I love Hogarth! Especially his assistance with both Vauxhall Gardens and the Foundling Museum, both of which are close to my heart. Visited his house and museum in London near Chiswick House last summer.